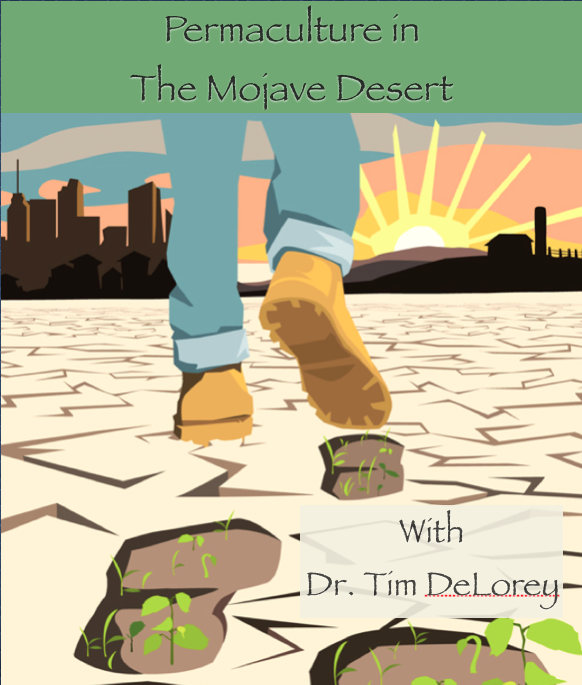 Saturday, May 6 from 3 - 5 p.m.
An introduction to the principles of permaculture as adapted to arid desert environments. Permaculture is a design method that combines art and science to help foster a transition towards a more regenerative relationship with ones local ecosystem. Tim is a highly published research scientist with a keen interest in exploring the “Natural Intelligence” expressed through one’s relationship with the Nature.Tim has been highly involved in permaculture for the past six years and is regularly involved in designing permaculture initiatives. He is a longtime member of the Transition Town Initiative in Joshua Tree (TJT). His current research interests range from the design of drylands permaculture systems to exploring soil building strategies, water harvesting methodologies, building with earthen materials and assessing nutritional densities of native desert plants. Through consultations, lecturing, workshops facilitation and publications, he is contributing his unique perspective to fostering a transition towards a more balanced way of being. Tim’s company, Eden Regenerative Design, based out of Joshua Tree, California, aims to help clients move towards developing a healthy, balanced working relationship with their external environment.